Robert Alonzo Brock (1839-1914) served as the Corresponding Secretary and Librarian of the Virginia Historical Society from 1875 until 1892. 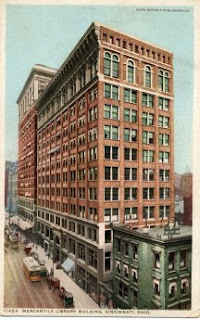 He also served as the Secretary for the Southern Historical Society. While at the Virginia Historical Society he developed an extensive publications program. So extensive in fact, that it brought the society to the brink of bankruptcy. This situation caused his eventual removal from the post of Corresponding Secretary and Librarian by the society’s board. The publications program of the society also generated a significant amount of correspondence. 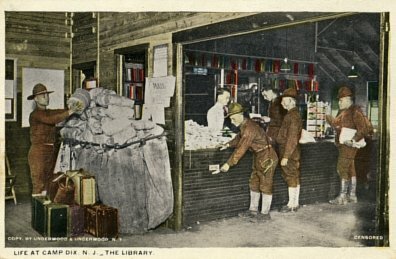 Envelopes sent to or from libraries before 1900 are scarce. 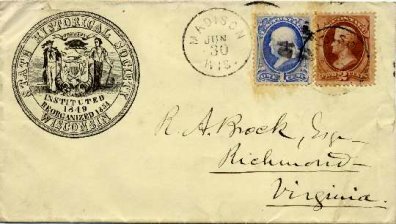 So it is unusual that from various sources I have been able to acquire more than forty envelopes that have been sent to the Virginia Historical Society and the Southern Historical Society during the period when Brock was associated with the two historical societies. 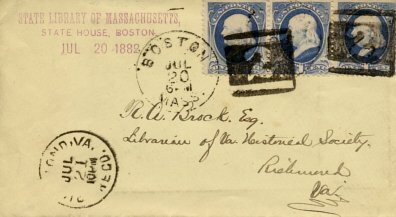 Most are addressed to R. A. Brock. The question arises as to who and why were the covers retained. There is a good possibility that Brock, himself, may have saved the covers. In any case, at some point a large group of these envelopes passed into the hands of a stamp dealer and I am now the beneficiary of that action. Brock was a collector of rare books and the “Brock Collection” is located at the Huntington Library in California. 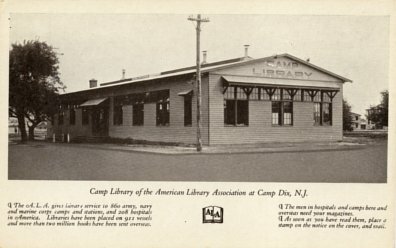 More on R. A. Brock can be found in the July/August/September 2003 issue of Virginia Libraries. Donohue Rare Book Room summer hours are Monday through Friday, 9:00 a.m. to 5:00 p.m. For further information, please call (415) 422-2036. It doesn't take much to send me off on a tangent. 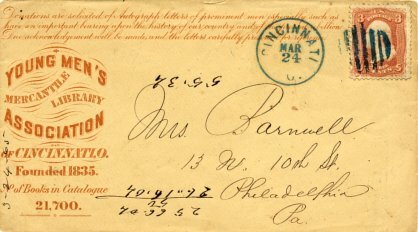 This time it was a small label (2 3/4" x 3 1/2") which requested information about publications related to mail art. The label was distributed by John Held, Jr of the Fine arts Division of the Dallas Public Library in 1988 and was designed to be affixed to an envelope. Held's purpose was to develop "An Annotated Bibliography of Mail Art". 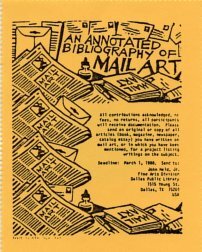 Held received hundreds of responses to his request and later published the results in the book Mail Art: An Annotated Bibliography (Scarecrow Press, 1991). What is mail art? [see Wikipedia's answer] [see Oberlin College's answer] Mail art encompasses a broad range of art forms. There is, of course, the official mail art of governments which takes the form of postage stamps. Artists and graphic designers from around the world design thousands of these each year. I had an earlier post about my favorite library postage stamp designer Bradbury Thompson. Another common mail art form is illustrated envelopes that are designed by cachet makers for the first day of issue of a new postage stamp. These are commonly called first day covers. I have hundreds of first day covers for library postage stamps in my collection. 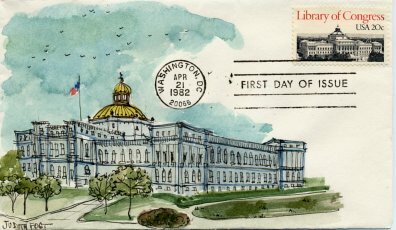 One of my favorite first day covers is for the 1982 Library of Congress postage stamp which is shown above. It was hand painted by cachet maker Judith Fogt. There is a more avant-garde aspect to mail art, however, and John Held is one of the foremost authorities on this genre of mail art. This format includes artistamps which are postage stamp like depictions that often carry an underlying message. Oberlin College has a collection of over 25,000 pieces of mail art. Some examples from their collection is located HERE. There's a nice variety of mail art depicted on this Pinterest site. 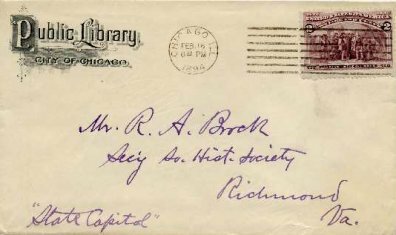 The Library of Congress Center for the Book's Letters About Literature site has some interesting envelope art. Back for a moment to John Held, Jr. While at the Dallas Public Library, Held curated a major exhibit of library rubber stamps which I wrote about in this blog post.